Do you feel that crazy itch? The crazy, physically-real decluttering itch? Me too. It happens as soon as Christmas is over. Grab a trash bag (black is best so other people in your home can’t see what you’re putting in it . . . ) and start throwing away visible trash. It’s too simple. I know. But going through the house, throwing away visible trash first, is truly the BEST way to make a visible impact on your home, and a visible impact will improve how you function in your home and will inspire you to keep decluttering. Here’s the real life story of how I developed The Visibility Rule as a strategy for decluttering my own home. You have to start somewhere, and I know from (way too much) personal experience that getting started is the very hardest part of a decluttering project. My best piece of advice for getting started is to do the easy stuff first. I explain what I mean by that here, but just know that the easiest of the easiest stuff is throwing away trash. Just remember to prioritize by visibility. Start in your most frequently used (and seen by visitors) area, like your living room or kitchen, and then move to less often used spaces. Do the surfaces of each room first, and THEN start opening doors and drawers to look for more things that can be trashed. KEY: Sticking to the Visibility Rule means you’ll see a difference in your home today. Whenever you stop (whether finished or not), you’ll see progress. Need a Win? Grab a Trash Bag! I’d love to hear how your decluttering is going? Share your successes and struggles in the comments! 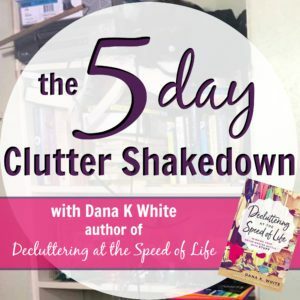 I also recommend my video course, The 5 Day Clutter Shakedown. If you’re desperate to declutter or just would like detailed guides, check out my books: How to Manage Your Home Without Losing Your Mind and Decluttering at the Speed of Life. The visibility rule rocks. I also tell my clients to go by the “most used” rule. Organize the spaces that are most used, like the entryway or the kitchen…which are, also the most visible. Yeah, I need to get on that de-trash thing. It’s now Tue. and I haven’t done anything about half the trash from Christmas. 4 bags of trash went to the porch that day! But the cans were so full from my professional organizer being here Dec 21, getting me family gathering ready, that not 1 more thing could fit. So, ok, the trash was picked up yesterday, so that excuse is blown. So, ok, maybe I’ll get on it tomorrow. I found room for our blankets, bedspreads, throws, etc. in the armoire where I keep things like that in the guest room. Filled another big bag for Goodwill with a bedspread, a duvet cover (from hell), 3 toss (uh, yeah) pillows, a spare shower curtain, a dust ruffle, some sheet sets, pillowcases, and even one of those old electric “sinus relief” masks. Some of the contents are from the linen closet cleanout, which happened a few days before. I guess we have over 2 bags by now, with the addition of lots of pairs of “skinny” pants (all with pleats) from the 90s. Time to let go of those, and quit fooling myself! Now I no longer have a PILE of stacked spreads and blankets on the guest room floor! ? So we are due to move house at the end of January – perfect opportunity to have a sort out. I just don’t know where to start! Wish me luck, I have a playroom for the kids in my current house but not in my new house- everything needs o go in their rooms! ? I am getting ready to declutter. We had restoration work done and someone else packed and partially unpacked my house I don’t know where about 1/3 of things I use on a weekly basis are. Jan 7th, my friends are coming over and we are ripping this place a new one. Chairs are being tossed, tables are being moved, bookcases are being switched and by goodness I’m finding my extended reach stapler! As we unbox things, the keep (if so, where does it go)/ donate decision is made at that moment and if it’s donate, it’s going in the trunk and going to be gone that day. My daughter & I live with my mom. We have way too much of pretty much everything. While I can’t get my mom to give up stuff I have gotten rid of tons of clothes my daughter & I can’t/don’t wear anymore. The thing is we still have WAY too much clothes. How do you give up clothes you can still wear & like? We have the same issue with toys as well…..please help! It’s all about the Container Concept. There are podcasts and posts here on the site about it, but do you have my book, Decluttering at the Speed of Life? We’ve been cleaning out kid toys that have been in our attic. Now that we have a granddaughter, I only want to keep the best of the best. I kept asking myself the container question to help me decide what to keep. If I don’t have a home for it, I don’t need it! Thanks!